Your probably getting fed up of me saying the Blood2 multiplayer patch is coming, but it is gonna be with you real soon now. There's still a couple of bugs that the team are working hard to iron out so you get the ultimate BloobBath experience when it's released, but it will rock! Looking further ahead, check out the screenshots in the news that PaulB was kind enough to send us, they rock, and the mission pack ain't too far away either! Rock! This week's topic was about your opinions on the recurrent patching up of Blood2. Quite a few of you were interested and voiced your opinions, so head on over to the mailbag to read all about it. Next week's Mailbag topic is "Blood2 or Blood1, and why?" Have a point to make about which you prefer? Get scribbling to mailbag@planetblood.com. With the release of SIN and Half-Life, and with the impending release of Aliens Vs. 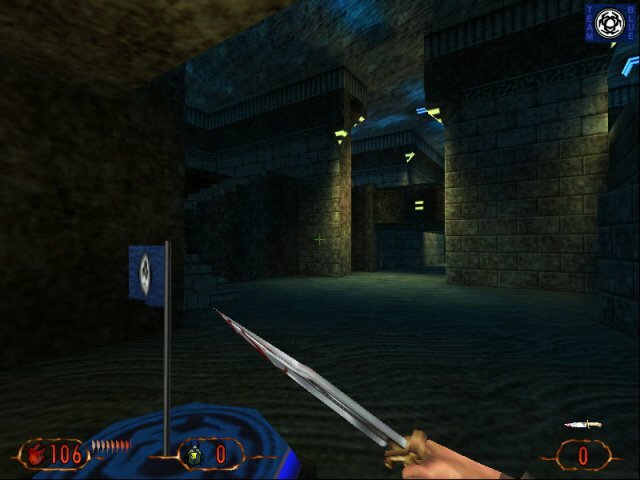 Predator, Descent 3, and other innovative titles, one's standards by which to measure a First Person Shooter have been raised to a refreshingly intellectual level. But, to remind us all that what we really want to do is launch a grenade into a room of civilians and walk in laughing as the cloud of vaporized blood settles and the guts slide down what's left of the walls, there is Blood 2. It's one of the most refreshingly, unapologetic, straightforward gore feasts to come along in a long time. On top of that, it has a quality of gameplay and design that puts games like Quake 2 out on the street, unloved, unwanted, with a little "Will Strip For Silicon!" sign. Check out the rest of this review here. Like GameSpy, MP3Spy is a server browser. Instead of finding the best game servers, though, MP3Spy hunts down Winamp SHOUTcast servers. That means you can stream .MP3 files right to your desktop and listen to music and stuff from all over the net! It also has a built-in chat client, so while you're listening to someone's music you can send requests to the DJ or just hang out and chat with people who share your same musical tastes. MP3Spy is available from MP3Spy.com. You'll need an MP3 player for it to work, so stop by Winamp.com and download Winamp. (It's their awesome SHOUTcast technology that made this possible!) Then hop on MP3Spy, find some buddies, crank up the volume, and bask in the miracle of music on the net! Blood 2's plot is pretty cheesy. You play an immortal member of the Chosen, a group that has been around for centuries. You mission is to combat an equally long-lived organization known as the Cabal. The enemy has now taken the form of a massive corporation called Cabalco, headed up by the stereotypically evil Gideon, your arch nemesis. Cabalco is doing strange experiments with humans, creating zombies and horrific mutations. Naturally, you must put an end to all this. While the plot is nothing special, it does provide an excellent atmosphere. 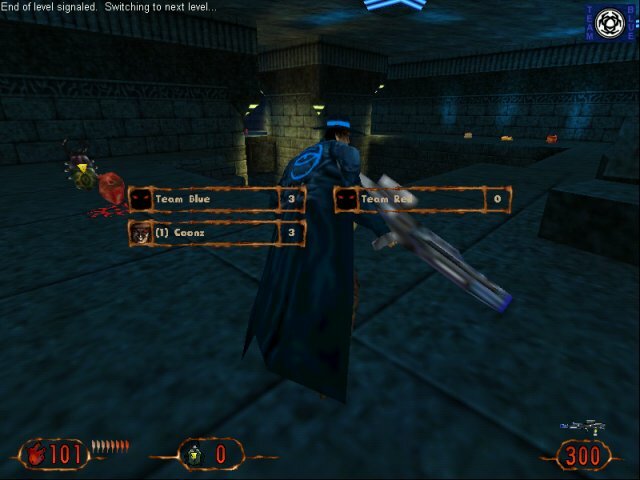 Imagine the gothic style of Quake mixed with futuristic cyberpunk and polished until it shines. All of the enemies are incredibly slick, from the Men in Black-like Cultists to the alien Shikari. These monsters are placed in levels filled with complex and dark architecture, sporting near-perfect lighting effects. Grape's Thoughts has a poll running asking "Which game has the monsters that you don't want chasing you in the nights the most?" Hmm that's as easy one. Let's use the process of elimination. First off Shogo monsters. They're basicly either giant robots or various foot-soldiers, not too scary. SiN? Common...Quake or Quake2? Does anyone even play the single player? That brings it down to either Blood II or Half-Life. 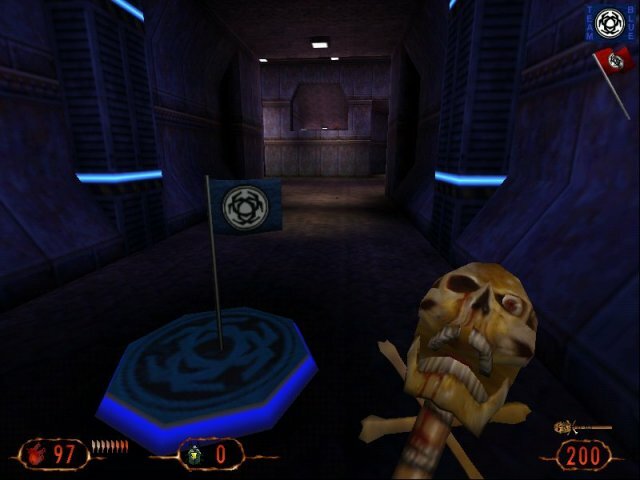 Half-Life has the zombie critters and head craps, scary in places but overall not a very traumatic experience. I guess that leaves Blood II as winner. Go vote! Vangie, the Rage of Mages girl, and Stef the Shogo girl are looking forward to tonight's show. Find out about the top games from Monolith, and what's up with that Gruntz thing (what IS multiplayer anyway...battle of the straws?). It's Jason Hall's turn to be part of what is quickly becoming one of the most original, and strangest of interviews around, the Lilith & Eve interview! How much can 2 girls pack into 1/2 an hour? With Jason Hall on board...who knows! Use your Real player dealie to watch the show live at 5:30pm EST (and of course, in archives any time after that), and either the ichat plugin or your handy dandy irc client pointed to chat1.pseudo.com #allgames to chat during the show! Be sure to tune in at 5:30pm EST. For more info, check the website at http://www.allgames.com/lilitheve. The return of the robed Cultist from Blood 1, complete with sound effects. :) I think the strongest aspect of the Blood 2 add-on is the idea that we didn't want to create a tack-on to the Blood 2 story, but rather have fun with our concepts in the Blood world. By tack-on I mean that most add-ons are footnotes to the storyline of the original product. In the original game, the player fights the greatest evil/villain/mutant ever seen, and in the add-on they clean up whatever's left, like they're running janitor duty. :) For the Blood 2 add-on we came up with a campy idea that would allow us to have fun with the characters, settings, and enemies, creating a whole new experience apart from Blood 2. We also plan to take advantage of the multiplayer enhancements that will be added to Blood 2 by the multiplayer point release. We'll be adding quite a few new multiplayer levels and at least one new multiplayer mod. I'd say the most impressive game I've played recently has been Tenchu: Stealth Assassin for the Playstation (thanks for the recommendation, Craig!). I haven't seen Zelda yet, or my answer would probably be different. :) I've been playing catch up on games that I didn't get to play while I was working on Blood 2, and of them I've found Rainbow 6 to be really satisfying. 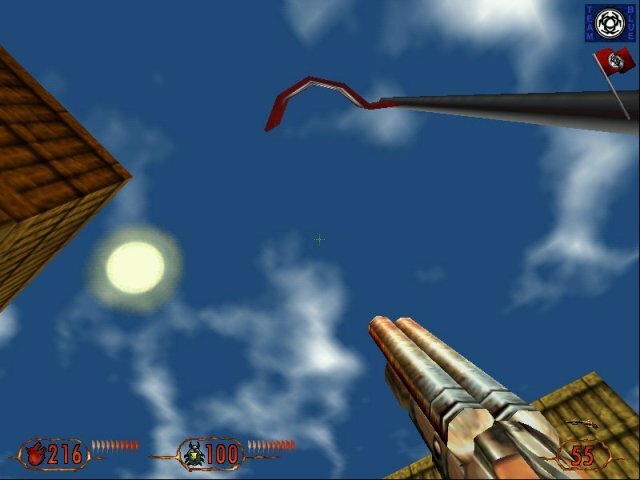 I also enjoyed Half-life and Fallout 2 as well. I've been playing a lot of Starcraft: Brood wars on B-net, and I've actually started winning a game or two (with the help of Bill V., Ben C., Nathan H., and Schlegel). At home I've been playing Thief, Baldur's Gate, and Carmageddon 2. CGO posted some Blood II tips. Here's a few of the "tips"
The Rule of Collateral Damage � �but do it from a distance, because some stuff explodes. The Rule of Wet, Squishy Damage � Kill anything that moves, including innocents, because they sometimes carry health vials (those nice juicy hearts you see palpitating about occasionally).